Servals are at home among tall grasses in central Africa. Because they can find food easily in marshes and reed beds, they prefer these areas over arid lands, including the Sahara. Servals eat rodents and birds in the wild, and they eat meat at the zoo. The serval looks oddly put together, with legs that seem too long for its body, ears that seem too large for its head, and a coat that might have been lifted off a cheetah. Medium-sized members of the cat family, servals are generally a gold to dark gold color on their backs, lighter (often white) on their undersides, and have many dark spots. The tail also has several rings and a black tip. The serval’s strange physical appearance is no accident, though. This cat is well adapted for life in the grasslands. The serval’s enormous ears help it to locate prey rustling in the grass. Those long legs allow it to see above the grass line, scan for movement, and pounce when the time is right. Its cheetah-like spots and stripes help to break up its silhouette and camouflage it against a backdrop of grass or woodland cover. 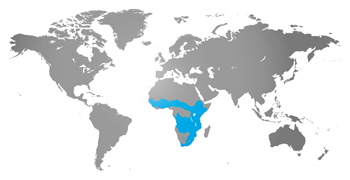 Servals are mostly solitary animals and are also mostly nocturnal (active at night). The serval can run or bound quickly for short distances. They can leap 10 feet upward and catch birds in the air. Servals also have been seen bounding in random patterns through tall grass, spooking prey into flight and then pouncing. There is no definite mating season, but most births tend to occur in the warm months from September to April. Females can give birth twice a year to an average of about 2 babies in a litter. The babies weigh only 8 or 9 ounces and open their eyes 9 days after birth. A mother serval will shelter her vulnerable newborns in a rock den or perhaps in the abandoned burrow of an aardvark or porcupine. After about nine months or so, though, she will chase them off to let them know it’s time for them to live on their own.